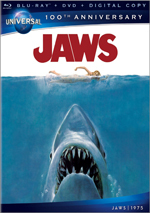 43 years after its release, 1975’s Jaws continues to define its genre. We’ve gotten many more entries in that realm over the decades, but none function on a par with Jaws. But filmmakers continue to explore the “shark-attack” theme, and 1999’s Deep Blue Sea gives another take on the topic. Directed by Renny Harlin, this effort follows the Aliens route as it beefs up the competition. Instead of just one shark - as found in Jaws - Sea provides a slew of toothy beasties, and we find super-sharks whose brain development has been amped up in an effort to develop a cure for Alzheimer’s Disease. Unfortunately for the human denizens of the research facility, the critters seem to be a little too smart, and just like the raptors in Jurassic Park, they’re coming to devour as many scientists as possible. Despite its extensive backstory about research and whatnot, the plot to Sea becomes nothing more substantial than “run from sharks, try to avoid death”. Jaws featured a stronger backbone as it explored the impact upon a small vacation community when a shark makes meals of the tourists. Oh well - not every flick can be as rich as Jaws, and there’s something to be said for fun and exciting “popcorn” movies, which is why Jurassic Park worked. Unfortunately, Sea fails to offer much more than a handful of minor jolts. As a director, Harlin rarely produces true atrocities, but he never makes anything genuinely terrific either. I usually find his movies to offer general entertainment but there’s something vaguely off-putting about them, as they seem terribly mechanical and they lack much spirit or zest. The same feelings hold true for Sea, though on the surface, there appears to be a lot to like about it. The action comes at us relentlessly, and the pacing ramps up the thrills in an appropriate manner. The production values appear fairly solid. Although the CGI sharks show their age at times, the movie features them in a way that usually hides the seams. And yet, there still seems to be something missing from Sea. It doesn’t help that virtually all of the characters appear to be generic cut-outs with almost no personality of their own. Sea actually features a fairly solid cast. It lacks any true “name” actors other than Samuel L. Jackson, but we find a host of familiar faces here. They’re a diverse and experienced group, and that helps make the story a bit more compelling. Unfortunately, the characters seem so bland that none of the performers can do much with them. Stellan Skarsgård probably succeeds best of the bunch, but he gets so little screen time that he fails to make much of an impression. Jackson offers a welcome presence, but he also finds himself saddled with a lackluster character who gets little room to develop. As far as shark movies go, Deep Blue Sea remains middle of the pack. It gives us enough thrills to remain reasonably entertaining across its 105 minutes, but it never threatens to elevate above that level of semi-mediocrity. 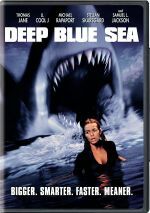 Deep Blue Sea appears in an aspect ratio of approximately 2.35:1 on this single-sided, double-layered DVD; the image has been enhanced for 16X9 televisions. Given the disc’s age and format, the DVD could’ve looked worse – but it definitely could’ve looked better. Sharpness seemed erratic, as most wider shots felt loose and undefined. Two-shots and close-ups offered acceptable delineation, but anything broader than that became soft. Moderate edge haloes exacerbated the lack of definition, and I saw minor instances of shimmering and jagged edges. In terms of print flaws, the movie showed occasional small specks but nothing major. Colors tended toward the usual teal and orange. The hues tended to seem heavy and too thick, so they lacked great range or clarity. Blacks felt overly dense and inky, while shadows came across as somewhat murky. The image remained good enough for a “C-“ but just barely, as it nearly fell into “D” territory. On the other hand, the movie’s Dolby Digital 5.1 soundtrack held up better over the years. The soundfield offered a largely good sense of the action, especially during the various shark attack scenes. Those allowed for various elements to spread around the room and present a nice impression of movement and impact. Music added good impact and the track melded together in a satisfying manner. Audio quality worked fine, with speech that appeared natural and concise. Music appeared full and rich, while effects were accurate and dynamic. This wound up as a positive soundtrack. The DVD comes with a decent roster of extras, and these begin with an audio commentary from director Renny Harlin and actor Samuel L. Jackson. Both were recorded separately and the results were edited together for this look at story/characters, cast and performances, sets and locations, music and audio, effects, stunts and action. Overall, this became a fairly engaging track. Jackson gives us the most entertaining remarks, as he discusses a slew of topics. From the origins of his involvement in the flick to his takes on the cast members, Jackson keeps his side of things light and funny but also makes sure that we learn some good facts about the making of the film. Unfortunately, Harlin dominates the commentary for reasons that are obvious to anyone who’s seen the film. Renny’s remarks are much drier and more technical than were Sam’s, so the track starts to drag somewhat after Jackson’s departure. Nonetheless, Harlin offers enough useful information about the effects and other aspects of the process to make the full commentary worth a listen. The track deserves your attention if just to hear Jackson’s frequent joking slams about Michael Rapaport. In addition to this commentary, we find two featurettes. Entitled When Sharks Attack!, the first program lasts 15 minutes, six seconds as it provides remarks from Harlin, Jackson, water and dive safety Damian Fitzpatrick, underwater director of photography Pete Romano, shark effects supervisor Walt Conti, producers Akiva Goldsman and Alan Riche, visual effects supervisor Jeffrey A. Okun, composer Trevor Rabin, and actors Thomas Jane, Saffron Burrows, Michael Rapaport, Jacqueline McKenzie, and LL Cool J. The actors provide their reactions to working with various forms of sharks - real and artificial - and we also learn a little about different technical aspects of bringing the piece to life. It breezes through the topics too quickly and superficially, but it covers a little of everything and offers a fairly decent feature. Next up comes the eight-minute, 23-second The Sharks of the Deep Blue Sea. This one includes comments from Harlin, Okus, Riche, Conti, McKenzie, and actor Stellan Skarsgard. “Sharks” strongly resembles the prior piece - they share some redundant material - but it focuses more closely upon the creation of the film’s effects. We hear more about how the artificial beasts were made and we see some good shots of the effects in action. Ultimately, it’s another superficial but moderately interesting program. Five Deleted Scenes fill a total of eight minutes, one second. All of the clips offer character-related material and develop the personalities a little better. No, the roles aren’t made clear and engaging, but every little bit helps. We can view the scenes with or without commentary from Harlin. The director provides a good discussion of the reasons for the omissions, so his comments are useful. We find the film’s original theatrical trailer, and there are Cast and Crew listings as well. The latter include short biographies of actors Burrows, Jane, and Jackson, plus director Harlin. A Stills Gallery provides 33 images from the production. As with most Renny Harlin flicks, Deep Blue Sea provides a decent and occasionally fun tale that fails to become consistently engaging and stimulating. You’ll get some cheap thrills from it but nothing about it comes across as rich or rewarding. The DVD provides mushy visuals along with pretty solid audio and a reasonable roster of supplements. I’ve seen worse shark movies but Sea never becomes memorable.